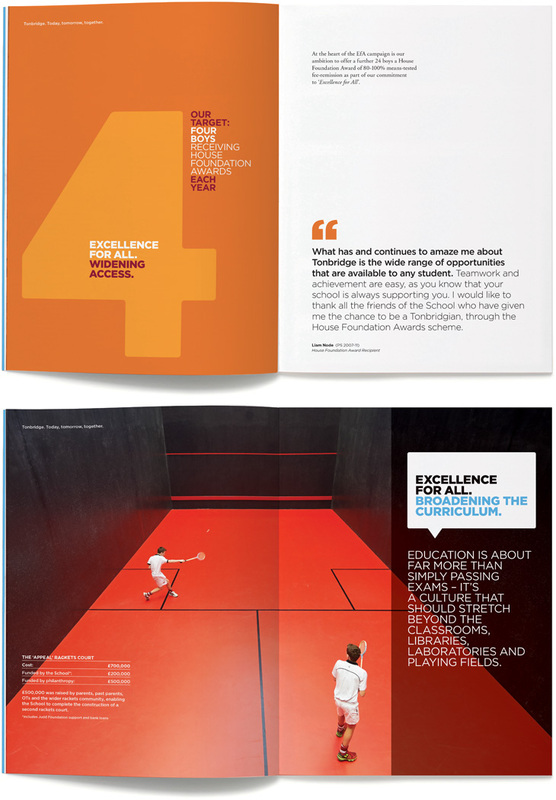 Tonbridge School has a clear long-term strategy which sets out their vision and aims for the future to ensure that Tonbridge continues to be a world-class school. The Excellence for All campaign focuses on three key areas: transforming the campus, widening access and broadening the curriculum. The brief was to develop a cohesive campaign that outlined all aspects of the School’s plans for the future and to raise awareness amongst the Tonbridge community of the need for philanthropic support. Thank you so much for everything you've done to get us in the best possible creative shape for the EFA campaign. The launch event was the culmination of a huge amount of work. I have worked with all sorts of creative agencies, big and small, and you stand out head and shoulders. I am truly grateful to you for what you've achieved and the way you've done it. Thank you again – you are a joy to work with. To create a strong campaign identity, key messages and visual language that sets all campaign materials apart from other school publications with an approachable, yet serious and informative, tone of voice. The campaign has been rolled out across a wide range of different applications and media, using a mix of photography and graphics, from printed literature and display stands to a digital animation that brings in a fun element and a website where supporters can donate online. The campaign has got off to a great start with a successful launch at Skinners’ Hall, home to The Skinners’ Company – one of the ‘Great Twelve’ livery companies of London. Support is gathering pace and several ‘Pioneer’ funders have already agreed to match every pound donated £ for £ up to a remarkable £1m. The School’s Development Office is quietly confident that the campaign targets will be achieved. The identity and strapline neatly encapsulate what the whole campaign is all about, giving a ‘sense of place’ and appealing to the Tonbridgian community to pull together now to build for the future. As well as raising funds for new buildings, the campaign also focuses on House Foundation bursary awards and a special projects fund to enable every boy the opportunity to spread his wings. A successful launch at Skinners’ Hall, home to The Skinners’ Company – one of the ‘Great Twelve’ livery companies of London. 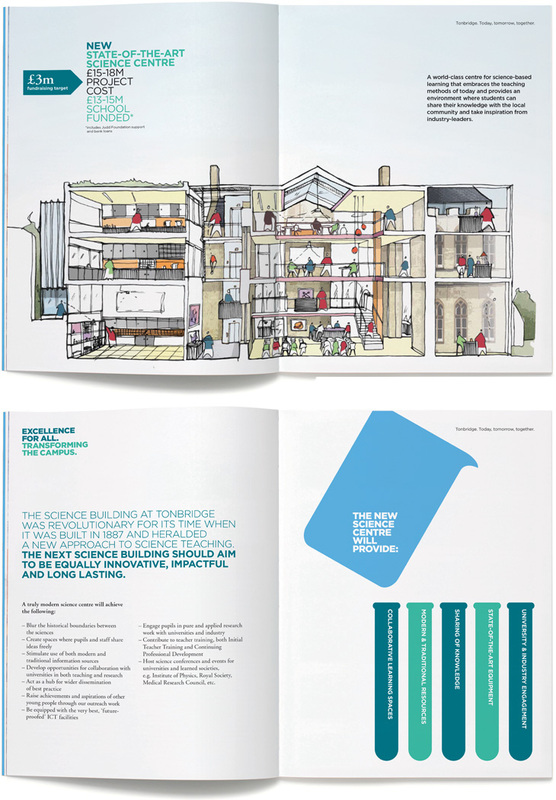 Bold, colourful graphics and key messages combine with school photography and architect drawings. Digital animation that introduces a fun element to the campaign. 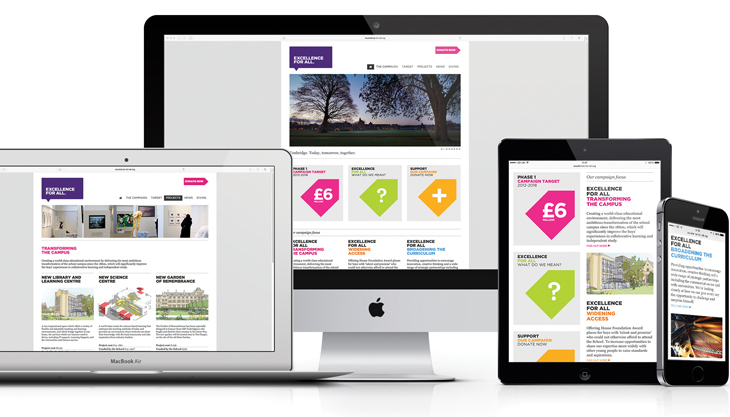 Fully responsive retina ready website that provides overview information and online donation facilities.